As 2009 draws to a close I thought it would be appropriate to look back on the year that was. On Friday I will provide a “sneak peek” into some of my goals for 2010. January 1, 2009 fell on a Thursday and marked the first week of marathon training for the Pittsburgh Marathon that would be held on May 3rd. The ramp up to Pittsburgh represented my most serious training effort to date in the hopes of finishing with a BQ (Boston Qualifying) time. For my age group that meant finishing with a time of 3 hrs. 20 min. 59 sec. or better. 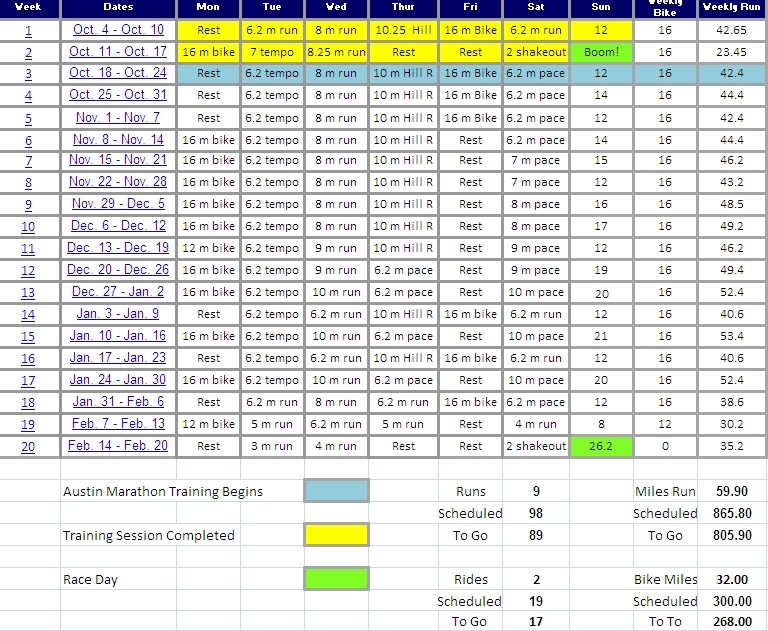 89 training runs, covering 687.2 miles over 18-weeks to make a run at a Boston time. I remember posting my training plan to the refrigerator and looking at each of the runs ahead. There would be no excuses, no skipped workouts, no complaining and no failing I told myself. I would eat right, get my rest and put myself in a position to qualify. At that point it would be left to the weather, the day and fate – but I was going to work hard to give myself the best chance for success. As weeks turned to months and race day approached I really felt like I had a great shot. I was able to run my three 20-mile training runs incident free and ahead of race pace – if I could hold it together for 26.2 miles I should finish with a time just under 3:20:00. Race day temperatures were right in my sweet spot as I love to run when the thermometer is showing 45-47 degrees. Overcast skies, very little wind and a slight chance of rain in the forecast. I could do without the rain – but when it comes to race day, you have to take what you get. As the miles ticked by and I hit the hill at Forbes (mile 13) and I looked down at my GPS we were right on target with a split time of 1:37:40. The much publicized hill at Forbes came at a great time for me as I always feel strongest between miles 12 and 16. The climb turned out to be more “hype” than “hill” as I only gave away 17 seconds on the incline which I would be able to make up on the decline between miles 22 and 24 if I could push through mile 20 without incident. Once again fate smiled on me as the rain showers showed up right as I crested the hill at Forbes and kept me cool throughout the final 12 miles of the race. After a brief fight with my body at mile 21 (this commonly referred to as hitting the wall) occurred when my body was changing it’s fuel source from glycogen (a very efficient fuel) to fat (a very inefficient fuel). Typically I struggle for the better part of 3/4 of a mile before my mind, legs and body sort out their differences and allow me to push through. ]The final two miles at Pittsburgh were some of the most enjoyable I had ever run. Well ahead of my time I was able to really focus on form, pushing through the end of the race and actually hear the shouts of encouragement from the spectators. Running under the overhang at the Pittsburgh Convention Center and seeing my time ticking forward from 3:17 I knew we had it. 3:17:43 was the final mark and we had made the field for this year’s Boston Marathon. In June I was bitten by the race bug again as recovery from the Pittsburgh race went better than I could have expected. I was back running just 4 days after the marathon and was back to a typical 30-mile training week in just 3 weeks. On June 20th I toed the line at the Holland, TX 5K and ran a very strong time at a great event finishing 9th overall and winning my age group in 19:47:3 (6:23 pace). With Boston still several months away over the summer my wife Dawn and I learned of our friend Dom’s diagnosis and priorities shifted in the blink of an eye this Fall. The possibility of running both the Boston Marathon (April 19, 2010) and the Pittsburgh Marathon (May 20, 2010) just 13 days later in Dom’s hometown became a reality on August 28, 2009. http://www.runfordom.com/ Each day since then has been dedicated to spreading the word about our effort to help Dom and his family as well as arriving in Hopkinton, MA with the goal of not only completing Boston – but then covering another 26.2 miles only 13 days later. We have come a long way in 2009 with 1,667 running miles logged since the start of the year. Ironically the distance between Austin, TX and Boston, MA is 1,692 miles – virtually the same distance. We have a long way to go in 2010 – miles to cover, races to run and dollars to raise for Dom and his family to help fight this terrible disease. To the 115+ followers on Twitter, almost 1,000 viewers of this blog, 125+ friends on Facebook and all of our Run for Dom donors both current and future – I want to let you all know just how much your support and kind words over the past year have meant to Dom, his family and to me. You are all making a difference as we Run for Dom in 2010. Please come back on Friday when we look at what 2010 has in store – until then, I wish you and your families a happy and healthy 2010. Happy New Year! 3 miles never felt so good …. Today was a very big day at Run for Dom. After experiencing only my second running injury in 5-years last month things are finally looking up on the training front. I have come to gain a new appreciation for running pain-free and especially the plight of those that suffer from shin splints. The past month has been especially frustrating as I went from comfortably running 32-38 miles every week to not being able to complete a single 5-mile training run. My cardio level, leg strength, core strength and mentally everything said “Go, Go, Go” while my lower right leg was saying, “Not so fast there junior”. As morning runs became an impossibility a new training plan needed to be developed including the substitution of low/no impact cardio work and strength training to keep our fitness level where it needed to be when I was able to resume running. Call me superstitious but on Saturday morning I had a very special consult with Dr. Sierra D’Eramo who cleared me to resume my running this week. Dr. D’Eramo (Dom’s daughter pictured above) gave me a full exam and deemed me healthy and ready to go. At 6:15 am as I laced up my Asics with only 16 weeks to the day away from the start of the Boston Marathon it was time to get on with it. As I took those first few tentative strides out of our driveway and up Palmbrook Drive I immediately felt different. Gone was the nagging irritation below my right calf and soreness on the inner part of my shin. I started the run on the same route that had run over 1,600 previous miles this year fighting to slow my pace and “take it easy”. The three miles I had scheduled this morning were covered in 21:27 (7:09 pace) – pretty solid with a more than three-week absence from running. It became apparent that my work on the bike has paid off as I coasted through the run with strong legs and strong lung capacity – great stuff. When I got back to the house this morning and went through the new ritual of icing my leg and stretching diligently – two things that honestly I had not paid proper attention to in the past – I realized just how easy it is to take things for granted. Things that we view as simple entitlements until they are taken away from us. For me it was the joy of being able to hop out the front door and run 10,12 miles anytime I felt like it – for my good friend Dom coming back from surgery it is everyday things that all of us take for granted such as being able to drink a cup of coffee, eating a bowl of oatmeal or enjoying your Mother’s home-made cavatelli on Christmas Eve …. Spending time with Dom and his family was a tremendous gift this Christmas as my wife Dawn and I got the opportunity to visit with Dom, his wife Val, his son Nico and daughter Dr. Sierra. Being able to laugh a little with our good friend and talk about how far he has come in his battle to beat this terrible disease. Dom’s biggest hurdle to cross right now is simply getting his body to adjust to the very aggressive surgery he had back in November to remove his stomach and spleen as well as a hot chemotherapy bath treatment to treat all of the other effected organs. Dom is struggling taking solid foods right now and is getting virtually all of his nutrition via a feeding tube. Despite knowing that he needs to eat and drink throughout the day the discomfort right now is so significant and the reaction from his body so severe that the pain can be unbearable. As Dom fights through this period of time where nutrition is his largest hurdle to gain strength for his next three rounds of chemotherapy we are just really beginning our race preparations for the Boston Marathon on April 19th and Pittsburgh Marathon May 2nd. Our revised training calendar calls for 63 runs over the next 16 weeks totaling 430 miles, 47 biking sessions covering 570 miles and 48 strength training sessions. 1,000 training miles to cover 52.40 race miles. Piece of cake. I have been saying this since we started this effort to help Dom’s family that I had it easy – and I have never been more convinced of that than this weekend. Dom is going to need to approach every day’s nutrition “schedule” as I do my training calendar. A series of small steps forward that will ultimately lead to the finish line. The key thing to remember is that it is not always going to be easy, sometimes it rains, sometimes it snows, sometimes the wind blows so hard in your face it feels like you are going backwards. The key is to just keep those legs churning and before you know it you have pushed through and come out the other side. Before today a 3-mile run was almost not worth the effort of lacing up the shoes – it seemed like it was over before it started. Today however, those were 3 glorious miles. I enjoyed every step along the way and felt a great deal of pride crossing them off of the schedule that hangs on the refrigerator door. Only 997 miles to go – I plan on making the most out of every single one of them. Merry Christmas Everyone from Run for Dom! Good morning everyone – just wanted to wish everyone a Merry Christmas and a Happy Holiday. Last night my wife Dawn and I were able to stop by our good friend Dom’s Mother and Father’s house to see the D’Eramo family. It was the first opportunity that we have had to see Dom since he was diagnosed with cancer and has gone through his treatments and surgery. The house was filled with three generations of D’Eramo’s, O’Brien’s, Richey’s, Aunts, Uncles, Cousins, Grandchildren, Nieces and Nephews …. as everyone held hands for the blessing the circle of family and friends literally encircled the entire downstairs of the house Dom grew up in. One of the things I have failed to mention since we have started the Run for Dom blog is the fact that one of my passions aside from Marathoning is eating. Many runners will tell you they distance run because they love to eat. Well Mrs. D’Eramo prepared the traditional Italian Christmas Eve dinner (the seven fishes feast) last night (Baccala, Smelts, Shrimp, Crab Cakes, Whiting), stuffed mushrooms, linguini and one of my favorite all-time pasta dishes, homemade cavatelli …. Man, was it good and I haven’t even gotten to the italian cookie plate afterwards …. wow. I even was able to give Dom’s son Nico his bottle before we left to head over to Dawn’s family’s Christmas Eve celebration (more great food of course!) which I’m proud to say Nico took down in record time in keeping with the theme of the night. (more pictures of Nico and Sierra coming when I get back to Austin. We are all looking forward to having Dom with us for many Christmas Eve’s to come – as well as Mrs. D’Eramo’s cooking! Thanks to everyone who has followed this effort and for our RFD donors to date – thank you very much for supporting my good friend and making a real difference in Dom, Val, Sierra and Nico’s lives. They are very precious to all of us. Merry Christmas everyone, I wish you and your families all a happy and healthy Holiday Season. God Bless. As we get caught up this time of year rushing around trying to prepare for the holidays, standing in lines, hustling from one store to the next (or web-site to the next) looking for that last gift it is easy to forget what it is really all about. This year I will be traveling up to Pittsburgh on Thursday morning to spend the holidays with my wife’s side of the family and on Saturday will be stopping by to visit Dom. For me this holiday season that is really what it is all about – spending time with those you care about and those that care about you. Take some time over the next few days to slow down and enjoy them – look for opportunities to make a difference in the lives you care about. Time is something we all have – it is just hard to realize it sometimes. I for one am going to make sure to not miss out this year on the hugs, the kisses, the laughter and the joy of being with those that make a difference in my life. Afterall, that is really what this time of year is all about. Thank you Ashley for reminding me – you are the greatest. Happy Holidays everyone! On Friday I received a call late in the day from Dr. Fernandez at Austin Sports Medicine with my MRI results from earlier in the week. Dr. F passed along very good news that the MRI showed no stress fracture or stress reaction in my lower right leg – only what we had been hoping for which was irritation and muscle straining around my tibia causing pain (shin splint). This pain which has kept me from running over the past two weeks is an obvious disappointment with respect to me kicking off my standard 18-week training plan ramping up to the Boston Marathon on April 19th. But with the proper perspective on our long-term goal of completing two marathons only 13 days apart this spring as we Run for Dom, perhaps this news and set-back is really a blessing in disguise? A few days prior to my MRI I received a book as part of my subscription to Runners World titled: Run Less, Run Faster. Like most marathoners I have a formula that works and I am very skeptical of training programs that tout reduced mileage as a way to improve performance. But since I had a lot of time on my hands as I rested and recuperated – I thought, why not? What can it hurt? The first thing that impressed me as I began the book was that the premise of the training program was not a short-cut schedule or a magic bean – but actually a very precise 3/2 program that removes your two shortest run days from your 5-day program and replaces them with cross training in the form of cycling, swimming etc. that allows for a tough cardiovascular workout but takes a lot of the pounding from your knees, hips, legs, feet allowing you to train harder during your three run days. Included in the book are countless stories from program participants (these are actually runners who enrolled in the program, traveled to Furman University in South Carolina to be tested and followed the program from start to finish in preparing for a marathon) with amazing success rates in reducing their marathon times by 10%-20%. These again were not only exceptional runners with previous marathon times in the sub 3:00 category – but also “everyday” marathoners with times of 3:45 to 4:15. For me as I know that logging 50 mile weeks is a far way off for me anytime soon, I am in fact looking to help get to the starting line at Boston as prepared as I can be, but also as “healthy” as I can be with Pittsburgh looming just 13 days later. What had been my intention of starting the transformation from Marathoner to Triathlete in 2012 has been accelerated by 24 months or so which will allow me to bike 2X per week in preparing for Boston and focusing on 3 quality runs over the next 16 weeks. Pictured above is my wife’s Christmas present to me (and birthday and anniversary and next Christmas and possibly next birthday). I spent the last week to ten days driving the guys down at Austin Tri Cyclist crazy with questions as I tried to educate myself in what kind of equipment would allow me to train effectively and ultimately race in a few triathlons in the next 12-18 months. The guys were great, I learned a whole lot and must say that for the first time in a few years am very excited to be taking on a new sport. I went from knowing virtually nothing about running and marathoning in 2005 to having a considerable amount of experience and knowledge in that sport. I hope that the transition to the Triathlon is as rewarding and in the interim will help me through the Run for Dom effort http://www.runfordom.com with strength, stamina and speed to spare. One thing I will say is that a new pair of $120 running shoes every few months now seems like peanuts to the cost of this new hobby … now if anyone out there knows any swim coaches in Austin please let me know – that will be a lot of fun to write about I’m sure. Happy Holidays everyone and thank you Dawn for my gift – you are the greatest. With the holidays approaching I thought it appropriate to recognize a key donation that was recently received for the Run for Dom effort. For those of you who are new to following the blog this journey started in August of this past year after finding out that our dear friend Dominic D’Eramo at the age of 38 years old found himself in the battle for his life. A husband and father of two young children – Dom’s world was dealt a serious blow. Details of Dom’s battle thus far can be found here https://joerunfordom.wordpress.com/the-story/ as well as in the side bar under the Key Posts heading. Some of you may not know that my “day job” is in fact in fundraising work. For the last 10 years I have been fortunate to work for the leader in non-profit fundraising solutions. The focus of my division is on College and University on-campus fundraising efforts. We are now located on 60 campuses across the United States and Canada employing more than 2,500 college students as well as more than 120 full-time staff members from California to Rhode Island, Texas to Ontario – and even the city of Grand Forks, North Dakota. Back in 2003 we started a philanthropy program called H.O.P.E. (Holiday Outreach Philanthropy Effort). This program was established to help our student fundraisers learn the greatest lesson in philanthropy that a small gift can really make a real difference. Each night in phonathon rooms around the United States and Canada our students would talk with alumni, parents and friends of their College or University and tell them just that. That their gift of $25, $50, $100, $250 would make a real difference in the lives of current students. Students just like them who would be able to enjoy scholarships, faculty development, programming and learning opportunities that would shape their futures – just as the generosity of others years before had done for them. The H.O.P.E. program was our way of bringing this lesson to these students as they were asked to vote on a local charity that they were passionate about (March of Dimes, Homeless Shelters, Adopt a Family Programs, Animal Shelters etc.) and each make a small donation of $5.00 to support the cause. This $5 donation which may sound insignificant to some is not the case for a college student where $5 is a meal, 2 gallons of gas, or that Starbucks Caramel Brulee Latte that gets you through a long night of studies. These $5 donations however add up very quickly and in fact our small “army” of student fundraisers donated over $13,000 to charity this fall supporting all kinds of worthy causes making a real difference in the lives of many this holiday season – I have never been so proud of our group. What was truly remarkable in the case of our students at UND was that they chose to support Run for Dom as their H.O.P.E. program effort. These students were very touched by Dom’s story and all that we were willing to do to help – in my case running two marathons in two weeks this spring in an effort to raise $26,200 ($26.2) for Dom and his family – that they chose this effort over all others to make a difference. Each of the student callers at UND made a gift achieving a 100% participation rate which is truly remarkable. Additionally we had several donations from the group far surpass the $5 goal at the $6 (Amanda Bullene, Kristina Gregg and Joe Laszewski), $10 (Collin Brumskill and Rachel Ripley) and even a large gift of $50 (Emily Wirkus)which was matched by our on-campus full-time manager Chris Brock. The final total of $258.98 is the largest single donation to the Run for Dom effort to date! An amazing accomplishment that proves that together a group of individuals can make a very large difference in the lives of others if they focus their effort and believe in a cause. I personally wanted to thank each and every donor from UND – Lauren Berg, Megan Bezdicek, Collin Brumskill, Amanda Bullene, Rachel Busch, Peter Christian, Lori Florine, Kristina Gregg, Courtney Hanson, Rachel Holt, John Kappel, Jake Kjellberg, Jaclyn Kramer, Joe Laszewski, Scott Lebovitz, Matt Mason, Emma Meyer, Blythe Nakasone, Gideon Ogbeide, Lexie Pullin, Rochelle Rietsema, Rachel Ripley, Samantha Ruane, Rachel Smerer, Bryan Stanke, Marcus Wax, Emily Wirkus, Seth Zander – and welcome them to our honor roll of donors. People continue to ask me about the two marathon in two-week challenge this spring and ponder “how can I do it?” Well, it is moments like these where the question I find myself asking is in fact how can I not? To the group up in Grand Forks – enjoy your holiday break and stay warm up there! Maybe I can talk you into making a trip out to Boston this spring for spring break and a little road race on this April. I’d never given running much thought to be honest. I had friends who ran and seemed to enjoy it. I’d “run” to the grocery store or the gas station. I’d been on numerous beer runs in my life. I’d even watched some of the best runners in the world run around the track at the University of Oregon while in college – a track made famous by Steve Prefontaine, a man who is almost worshipped in some circles I’ve heard. But the thought of actually getting up and running myself never crossed my mind. Running was something done either by people who have nothing better to do at 5 am or by Forrest Gump – it simply wasn’t for me. For the sake of full disclosure, it should be said that I am not built like a runner. I am 6’1” and between 250 and 260 lbs. This means that if I go back to the buffet after dinner, and Joe goes light on the salad during dinner, two of Joe equals one of me. I also like chicken wings. And microbrew beer. And a nice glass of pinot noir with prime rib and a loaded baked potato. Clif Bars and energy goo don’t really appeal to me. I don’t have any issues with people who do enjoy those things, but they don’t jump off the shelf at me when I go to a running store. On second thought, they may not jump off the shelf because I’ve never actually been to a running store. Size and build wise I was best suited for the all American game of football. The unfortunate thing for me was that I didn’t have the talent to play football. I played in high school as an offensive lineman and while I could bluff and say we won state, the truth is we stunk. And I was a third string lineman. A backup to the backup lineman on an awful team – athletic glory was not in the cards for me. All of this, combined with about 500 other excuses, kept me from running. Really it kept me from pursuing almost any athletic pursuit. I was happy sleeping in, tail gating in the parking lot before the game, and just generally thinking about anything other than exercise. Yet there I was the weekend before Thanksgiving with a number on my chest lined up for a 5k run. How did I end up at the starting line of an actual timed race? I wish I could tell you that I had a life changing event that put me on the road to running, but that simply isn’t the case. My inspiration came in the form of a treadmill taking up space in my bedroom. My wife and I purchased the treadmill with the best of intentions, but as is the case with many pieces of exercise equipment it turned into an overpriced coat rack. So as I tripped over the thing for the umpteenth time, I got upset and decided to use it. It wasn’t a grand revelation or some sort of bolt from the blue – I simply got mad at a bad investment and decided to do something about it. Don’t pass out along the way. 3.1 miles later, I hadn’t stopped moving, I finished in 38:36 and I didn’t black out. I was beat by a pair of nine-year old girls, but not getting beat by them wasn’t on my goal list so I was okay with that. So does this mean I’m now in training for a marathon and am working to shave seconds off each mile? No. It does mean, however, that I am getting out there at least a few times each week and doing some runs. I’ve had some days that I skipped or couldn’t do what I wanted to, but I didn’t give up like I would have in the past. I continue to find people who run like Joe to be amazing, and Dom’s story is truly inspirational. My situation is simpler but it illustrates that if I can get off the couch anyone can. I’m looking forward to running another 5k in early 2010 and shaving some time off the clock – maybe this is the year the nine-year olds go down. Rob Ackley works with Joe and lives in Ft. Worth Texas. In addition to ignoring running for most of his life, Rob is happily married with two sons. Note from Joe – Rob is a long-time friend and co-worker who I have known for over a decade. I have shared a lot of good times, not so good times, laughs, smiles and beers with Rob. I can’t say however that I have ever been more proud of my good friend than I was getting the call that he finished his first 5K. Way to go Rob, you my friend, are the man.